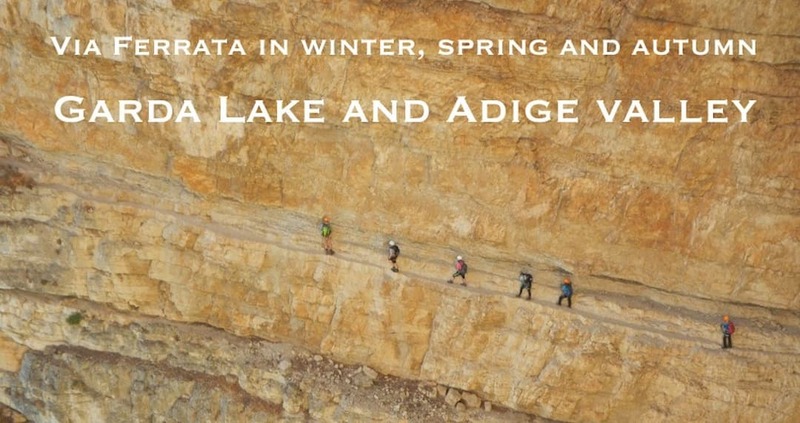 A via ferrata weekend in the winter season is really possible, the program that you can read here, that I name “Via Ferrata at the Lake Garda and Arco areas” is a realistic opportunity to try this fantastic experience of climbing in autumn, winter and spring. The lake Garda area have two important aspects: a mediterranean microclimate and many via ferrata of different difficulty and length. Both aspects permit us to climb these via ferrata in the “bad seasons”. Arco and Lake Garda are a traditional winter place for many climbers of Europe. Read below the proposals of Via Ferrata Lake Garda and Arco areas and don’t hesitate to contact me to elaborate togheter, your personal program for a single day as a large period or simply for a weekend. 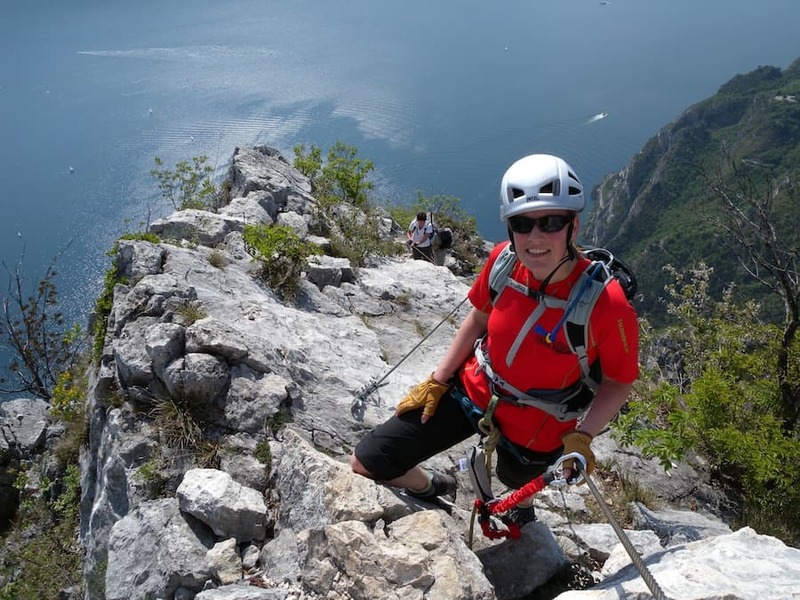 In autumn and in the spring we can climb every via ferrata in Arco and at Lake Garda. No limits for the length of for the difficult. In the central part of winter (december- february) 70% of these via ferratas are free of the snow and we can climb it. Personally I like very much this period because there are very few people on the via ferrata at Garda Lake and in the Arco area. Generally we meet only local climbers or nobody… especially out of the weekends. The easier via ferrata of this area, is a perfect solution for beginners where I can teach you every salient aspect of this art of climbing. A good point to introduce you on the vertical reality. This tour on the walls near Riva del Garda is not properly a via ferrata. At the begin of 1900, the government had the idea to build a road to connect Riva with the southern areas of the Garda lake. The first idea was to build this road, from Biascesa town at a medium elevation of 200 m on the long walls of the lake. It was build a test ledge to value this possibility…. but was a crazy idea, difficult for the realization. So, in a second time, was build the road of the “Gardesana occidentale” at the level of the lake (easier and not so expensive). This project was abbandoned and today is possible walk (and in some sections climb) along this artificial and exposed ledge!….. in some part very scary!!! A perfect winter hiking (and climbing) day, in a fantastic ambient. Max three people per rope with guide. 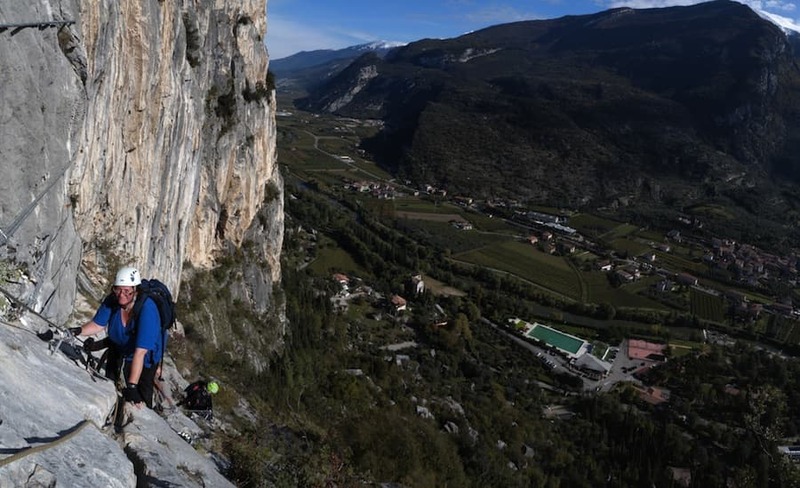 The via ferrata of Cima Capi is original of the First World War, a incredible and exposed via ferrata along the crest of the Cima Capi at the Garda Lake offer us a easy climbing in some point exposed. 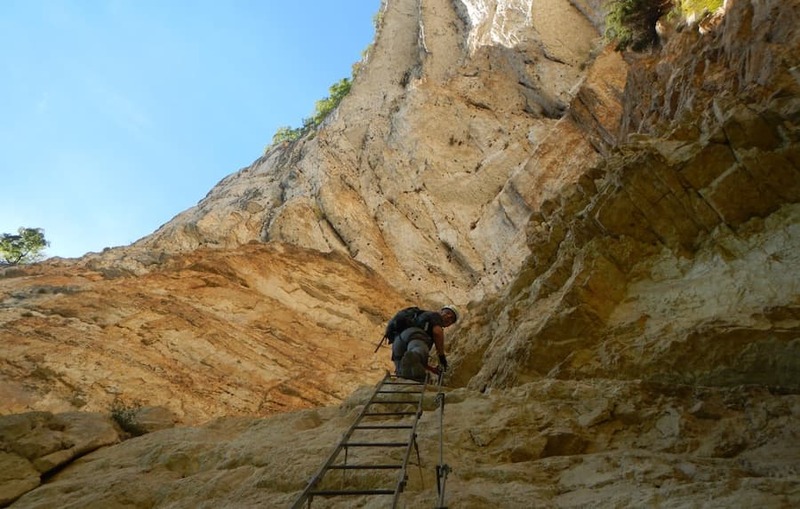 Climb this via ferrata ia as visit a museum of WW1 with bunkers and trench located in incredible positions. 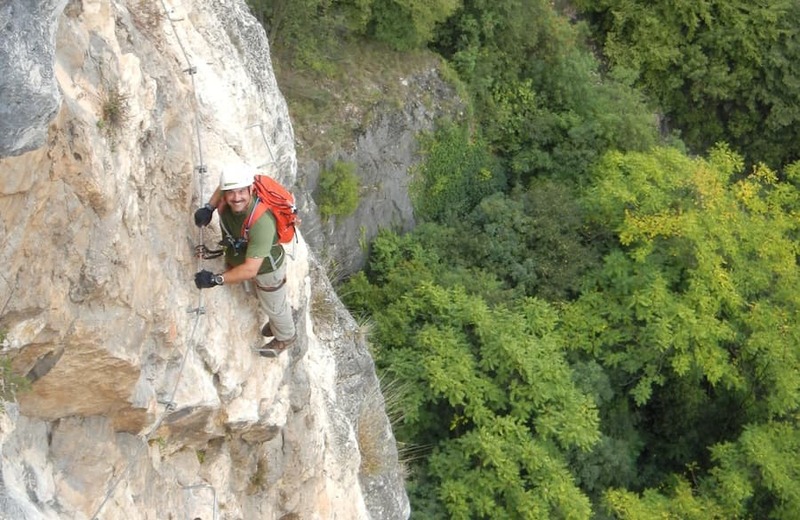 This via ferrata is one of the most classical target of the Garda Lake. A unforgettable panorama is guaranteed! 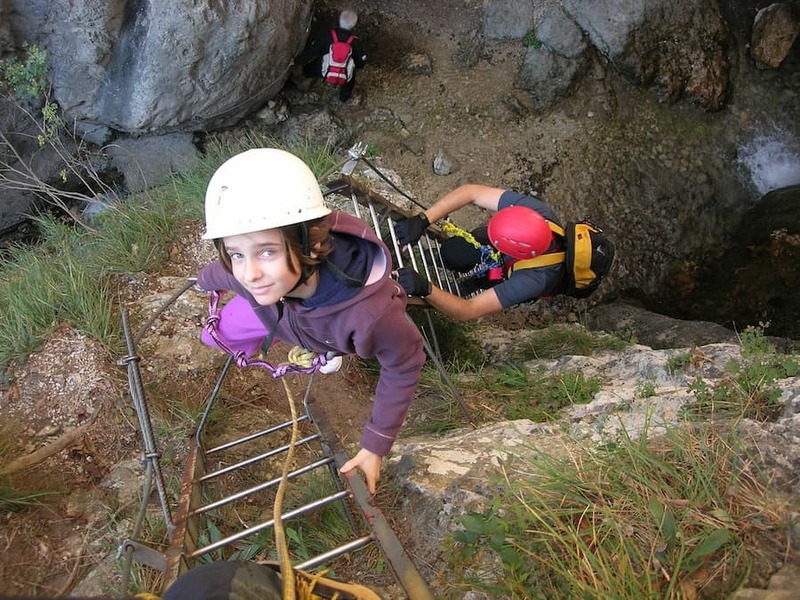 VIA FERRATA DELL’AMICIZIA – Cima S.A.T. The long via ferrata at the Cima SAT is the most exposed of the Garda Lake. A long succession of vertical iron ladders lead us to the top of this long via ferrata with a incomparable view at the town of Riva del Garda. In one of the most wild internal valleys of the Garda Lake mountains we find this unusual via ferrata that climb into a impressive and enormous overhanging basin. It’s a joke of the nature, how can stay up a so big overhanging of rocks? Only if we climb it we can comprise. 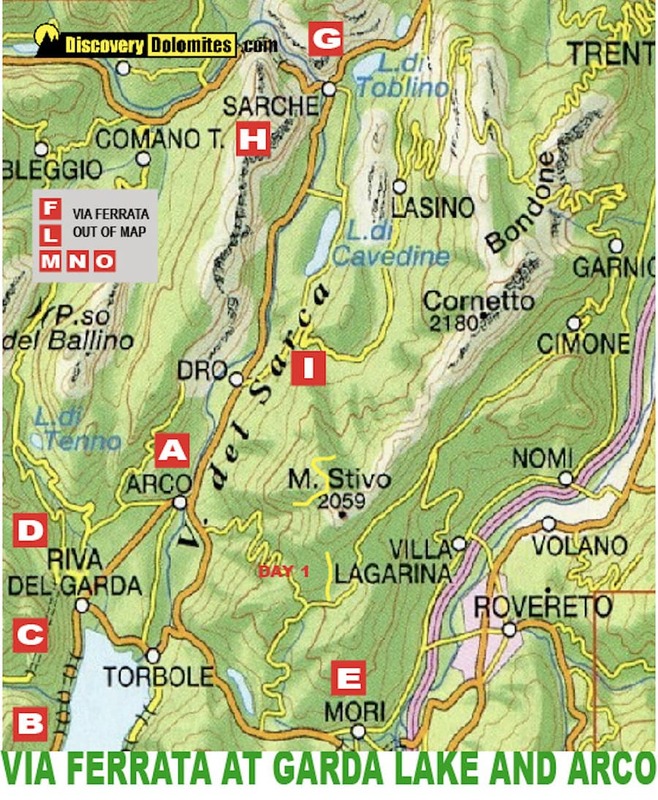 The Via Ferrata Rino Pisetta is the most difficult of the Arco – Lake of Garda areas. A continuos vertical wall for more of 400 meters end with a absolutely exposed pillar. Only for athletic people looking adrenaline. The gear of this via ferrata was recently renoved and now is brand new and total safety. The via Ferrata Che Guevara is absolutely the longest of this area of the Dolomites. It extend into a 1000 meters big wall. Is not difficult but it required trained hikers ready for a long trip in the vertical reality. It’s a great experience! 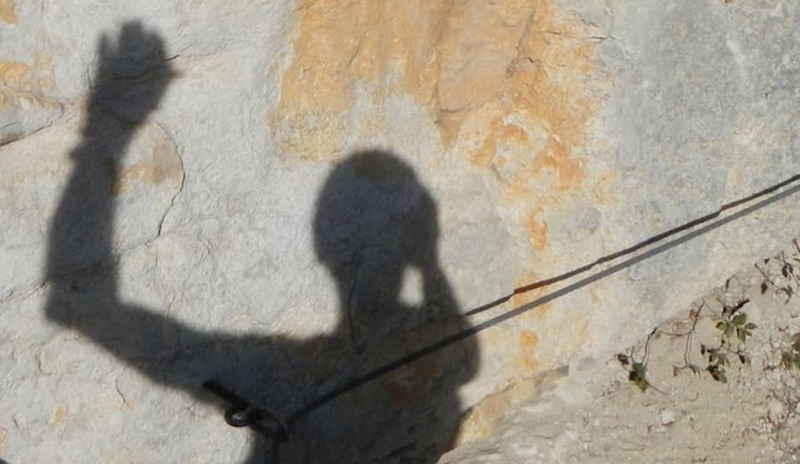 This via ferrata is the best targhet for families with kids, look the video! A short climbing with amazing and impressive part but not difficult and sure in total safety. 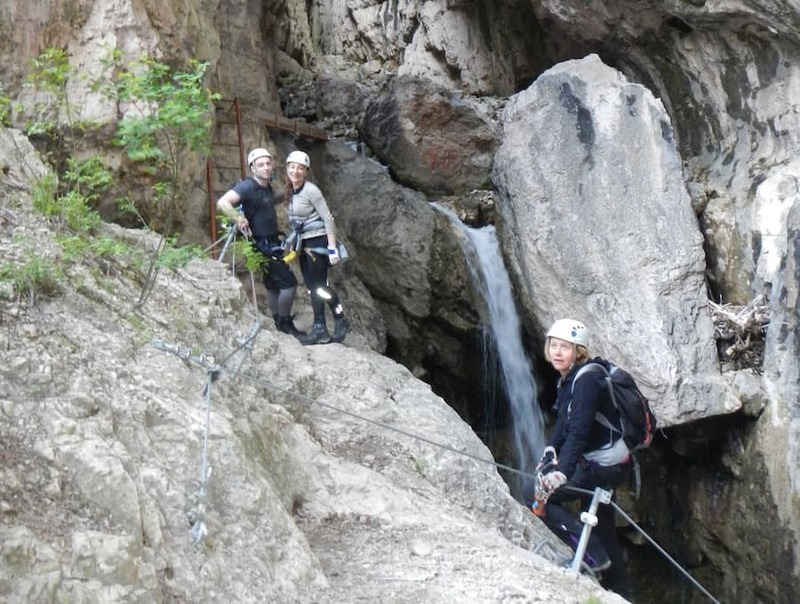 Similar at the Rio Sallagoni, this via ferrata is perfect for families with kids. In adjunct, the Via Ferrata Giovanelli, climb into a impressive canyon into the big wall of the Burrone di Mezzocorona. A solar big wall is the characteristic of this long via ferrata, never difficult, this via ferrata have a long envelopment into the wall of Favogna. At the final part, climb under a big overhanging rock structure with great panoramas. The local people name this via ferrata simply “Rio Secco” (Dry Creek). It’s a typical example of via ferrata of medium difficult with some athletic sections. This climb go along a waterfall line that for many months is dry. The Via Ferrata Hoachwoll is a new entry in the reality of the via ferratas of low elevation. It’s located north of Bolzano – Bozen on the begin of the Schnalstal valley in a perfect solar esposition and in a very particolar landscape. The climbing route take the name from the “Hoachwoll” water pipe line that was build at mid 1800 to carry the water on the farm areas of the upper side of the valley, it was a crazy build that crossed this wall on the middle side. Today we cross it with this via ferrata where we meet interesting remains of this “acrobatic” water pipe line. In short is the hardest via ferrata of this selection with a extra exposed tibetan bridge of 60 meters. A great target for trained hikers! On the north side of the Garda Lake, especially in the area of Arco, you can find many nice accommodation, I suggest you the following solutions of B&B and Farmhouse, but if you prefer others typologies of hotels, write me your specific preference. I can help you in the right choose. In this case, in line with a maximal flexibility for your preferences, I propose you only the daily mountain guide tarif, so you are total independent to choose your preferred accommodation. La Lanterna, is a famous meeting point of the the climbers. Bar, pizzeria and restaurant, this characteristic solution offer you some rooms in B&B and a large apartment. The position is very quite, good for your rest moments after intense climbing days. 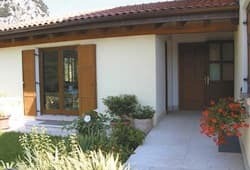 Is a B&B some kilometers north of Arco with a friendly managament. The Maso Lizzone is simply one of the best B&B in farmhouse of the Arco area. 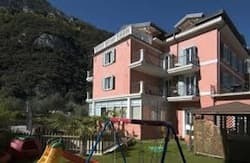 The Villa Bellaria is a B&B and apartment in the Town of Riva del Garda. I suggest this solution if you prefer the vicinity of the Lake. The via ferrata in the dolomites is a good proposal for a family holiday. Specially in the Dolomite you can find many easy and short via ferratas optimal for enthusiastic kids and moms with afraid. I can personalized your tour with others natural, historical or traditional attractions.